The experience of madness – which might also be referred to more formally as ‘schizophrenia’ or ‘psychosis’ – consists of a complex, confusing and often distressing collection of experiences, such as hearing voices or developing unusual, seemingly unfounded beliefs. Madness, in its various forms and guises, seems to be a ubiquitous feature of being human, yet our ability to make sense of madness, and our knowledge of how to help those who are so troubled, is limited. 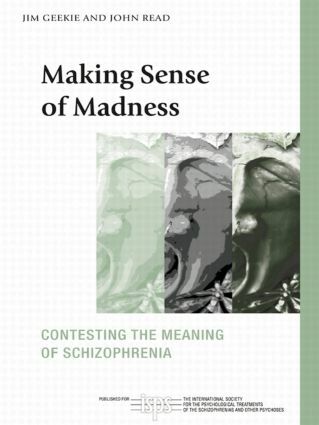 Making Sense of Madness explores the subjective experiences of madness. Using clients' stories and verbatim descriptions, it argues that the experience of 'madness' is an integral part of what it is to be human, and that greater focus on subjective experiences can contribute to professional understandings and ways of helping those who might be troubled by these experiences. Making sense of madness II: Lay understandings: what does the public think about ‘schizophrenia’?